Josiah Tattnall cringed as he watched the helpless British steamboats catch fire one by one from the well-directed fire of the Taku Forts. He could not help but feel sympathy for his English counterparts. Tattnall was serving as the Flag Officer of the United States East Indian Squadron, and acting as part of an Anglo-French fleet sent to the mouth of the Pei-Ho River on June 21, 1859. He had specific orders from the U.S. government to remain neutral toward the Chinese, even though the British and French intended to take an aggressive diplomatic approach. Born in Georgia in 1795, Tattnall entered the U.S. Navy in April of 1812 as a midshipman at the age of seventeen. Destined for an apprenticeship in the medical profession, he chose instead to pledge his life to the sea. He became notorious for his rash behavior. Following the War of 1812, he hunted down privateers in the Caribbean for a number of years. In one noteworthy incident, while in Valparaiso, Chile, he challenged a British officer to a duel who insulted his country, shooting the offender in the leg. At the siege of Veracruz during the U.S.-Mexican War, he received praise for “his most noble and heroic conduct.” While aboard the Spitfire, he came so close to the castle of San Juan D’Ulloa that Commodore Matthew Perry had to order him back at the risk of losing his vessel. Tattnall reluctantly pulled back, reportedly exclaiming in disgust, “Not a man killed or wounded!” For his brave conduct during the war, members of his home state of Georgia awarded him a ceremonial sword. 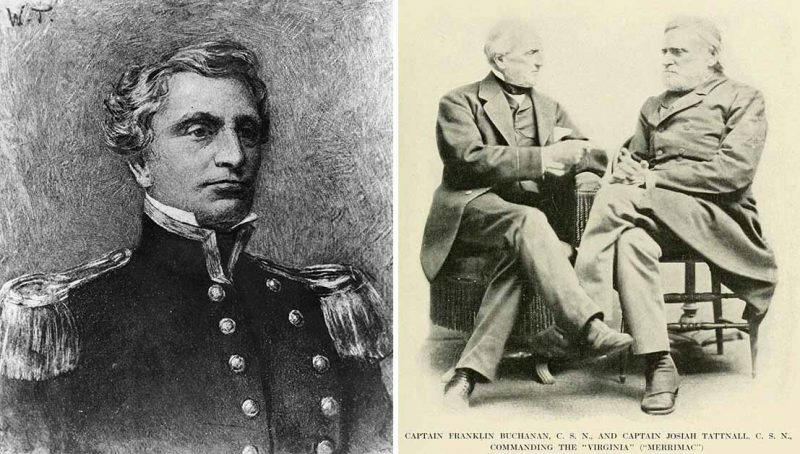 With forty-five years of seafaring experience under his belt, Tattnall was given command of the U.S. naval forces in the East India and China Seas on October 15, 1857. Negotiations with the Chinese had gone from tense to unstable as the British, French, and Americans attempted to force the Chinese to ratify one-sided trade agreements. Tattnall arrived at the mouth of the Pei-Ho River with his flagship, the Powhatan, accompanied by the recently purchased light steamboat, the Toey-Wan. The Pei-Ho was too shallow to allow the Powhatan to travel up the river, leaving the Toey-Wan as the only American vessel able to transport the American minister with a message from President James Buchanan to Peking. At the mouth of the river, Tattnall met twenty-one Anglo-French steamboats under the overall command of Admiral John Hope. At the head of the Pei-Ho River lay the Taku Forts garrisoned by Chinese soldiers. To his dismay, Admiral Hope discovered that barriers had been built across the mouth of the Pei-Ho, blocking access upriver to Peking. Hope intended to muscle his way through the obstructions when the Chinese defenders refused to remove them. Hope rammed one of the barriers with his gunboat, the Plover, cutting a path through which the remainder of his light steamboats and gunboats could pass.